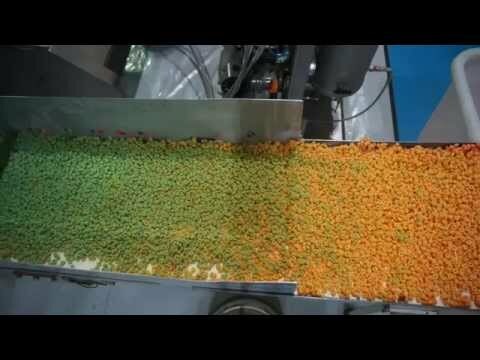 The traditional approach to multi-coloured extruded breakfast cereal and snack products has required a costly and time consuming shut-down and changeover between discrete runs of coloured product. By using a purpose-made colour-change system that works with twin screw extruders, colours can be changed instantly without slowing or stopping production, reducing costs and increasing efficiency. The Spectrum Colour Change System from Baker Perkins is an innovative design that reduces the costs associated with producing cereals where multiple colours are required in the final product mix. Designed to work seamlessly with twin-screw extruders such as the Baker Perkins SBX Master, the Spectrum Colour Change System (SCCS) connects seamlessly to your extruder HMI to allow for instant colour changes with no need to halt or even slow down the extrusion line. The SCCS introduces the chosen colour directly into the extruder barrel where thorough and uniform mixing occurs, resulting in the highest possible quality colour coating. An innovative Baker Perkins reduced volume die virtually eliminates the flow differences from inside to outside which means colour transitions occur extremely quickly negating any requirement to stop the extrusion process between changes. The in-built liquid feed pumping system is designed to work with oil, water and colourants, moving them in precise combinations from the in-built storage tanks to delivery in the extruder barrel. The SCCS integrates directly with the extruder HMI allowing for easy colour recipe change and full monitoring of systems including tank levels. Open frame construction and hygienic construction throughout makes cleaning and any required maintenance straightforward and quick, minimising downtime. Baker Perkins (https://www.bakerperkins.com) supplies technology for the bakery, biscuit, confectionery, snack and breakfast cereal sectors, The company’s production machines are based on over 100 years of experience in the field. Baker Perkins supplies technology for the bakery, biscuit, confectionery, snack and breakfast cereal sectors, The company's production machines are based on over 100 years of experience in the field.